Platinum blonde hair is arguably as popular a back in the emo style as in glamour girl fashionista world. Give this elegant platinum a shot if you feel black looks too harsh with your skin tone. This asymmetrical haircut is really flattering for a round face because it draws the eyes downward and creates some angles. Tease the layers on top for added height and face length. If you’re feeling like black for emo hairstyles is a little played out, try a hot new auburn hue. It’s still dark and if paired with the right makeup can give off a really vampy vibe. The bangs are cut in a wispy curved style which is really good for softening a square face or minimizing a large forehead with a heart shaped face. A textured and angular bob with long heavy bangs is a great emo hairstyle for girls. Have layers cut into the side and tease and tousle them slightly with some hair wax for an edgy style. 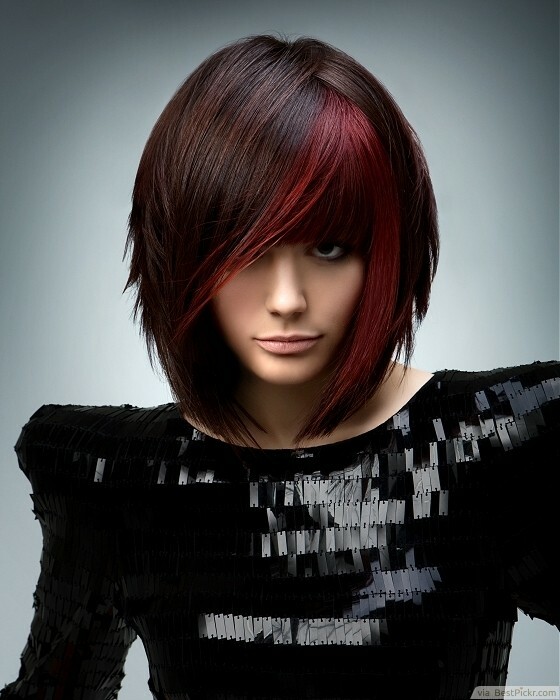 If you have brown hair, try adding a dark red color block for a subtle but intriguing contrast! Having bangs that shade the eyes is a popular emo look, so step it up a notch and have your bangs cut in a round frame for your face. Keep them polished with a shine serum for a luxe hairstyle. If you like dark hair colors but want something a little more interesting than black, try a mahogany. It has hues of red and purple mixed in for a really dynamic and beautiful hair color. Layered black hair with a top of volume on top is an emo fashion staple. Shake things up a bit in the haircut with textured dog ears to frame the face. 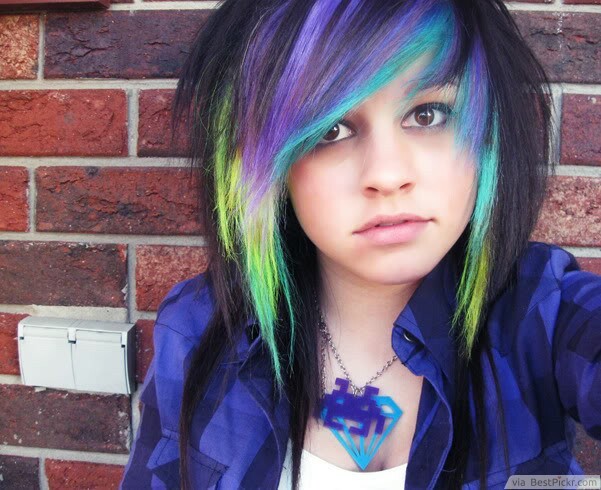 Then if you’re still left wanting more, try adding brightly colored peekaboo’s underneath you hair. These teal and pink ones hit the mark! The Lob (a longer version of a bob) is very flattering for almost every facial shape and hair texture. Long layers and shaggy cut bangs add a bit of texture but for some real oomph, add a punch of color. 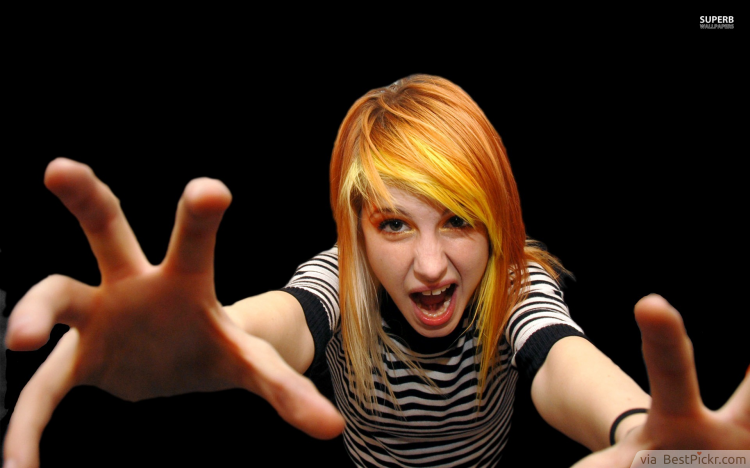 Haley Williams from Paramore rocks a yellow to orange gradient that outshines a ton of other emo styles. Looking to freshen up your medium length emo hair? Try a faux hawk on top by teasing your short layers and guiding them up and to the center with a bit of hair wax. You can even blend the faux hawk into the bangs for an edgy look. This is a fun way to add extra style to an all-black hairdo. 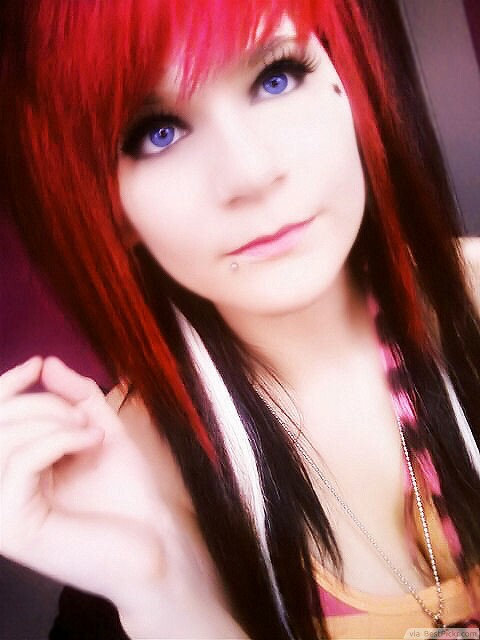 A vibrant red hue adds personality to an emo hairstyle. Want something to match that bold and fiery personality inside you? This is it! Black color underneath with a few blonde chunks and a pink a black striped piece adds a ton of charm and gives your hair an identity of its own. Want to add a jolt of color to your black hair? Try adding sections of bright colors that lay on top of each other. A really great way to do this is to use all cool tones so they complement each other nicely and don’t clash. Tease your shorter layers on the sides and smooth them down gently for this subtle volume.